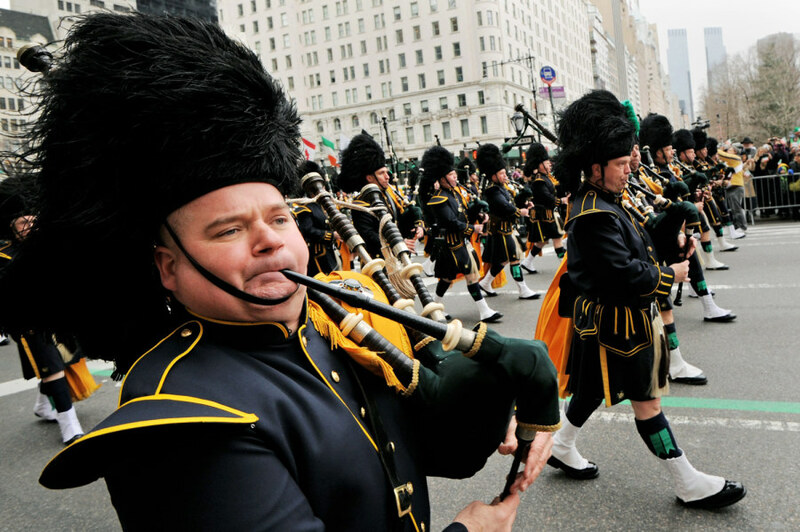 Bagpipers march in the 252st Annual Saint Patrick's Day Parade in New York, on March 16, 2013. With bagpipes galore and plenty of Guinness, Irish-American revelers – and their less lucky non-Irish counterparts – celebrated St. Patrick’s Day with parades across the country on Saturday. 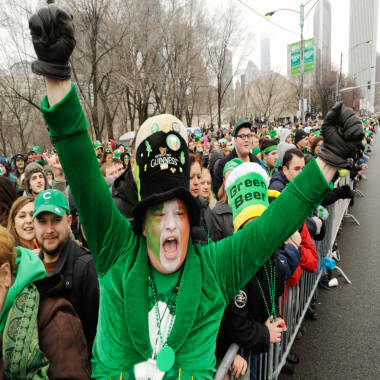 David Westerby of Kenosa, Wis. left, yells during the St. Patrick's Day parade in Chicago, on Saturday. Irish Prime Minister Enda Kenny marched alongside New York City Mayor Michael Bloomberg as crowds packed the route of the 252nd annual parade, and presented Bloomberg with a traditional Irish teapot. New York’s festivities put those in the old country to shame, said Ewan Armstrong, who was visiting from London. “I’m really digging the bagpipes,” said Armstrong, 23. Green-clad lads and lasses in Chicago bundled up for their city’s parade as temperatures hovered in the mid-thirties – but it would take more than that to keep Chicago Journeyman Plumbers from their annual rite dyeing the Chicago River a radiant jade, NBC Chicago reported. Of course, St. Patrick’s Day does not properly start until Sunday, when Boston will hold its annual parade. “There’s no place like the City of Boston when it comes to St. Patrick’s Day traditions and celebrations,” Mayor Thomas M. Menino said in a statement on Friday. 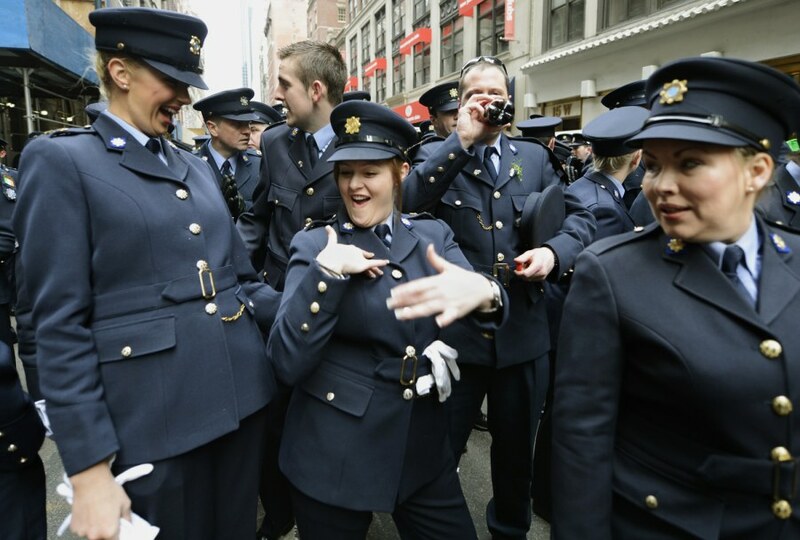 Members of the Ireland Police department wait to join the rest of the parade on 5th Avenue during the 252th New York City St. Patrick's Day Parade on March 16, 2013. 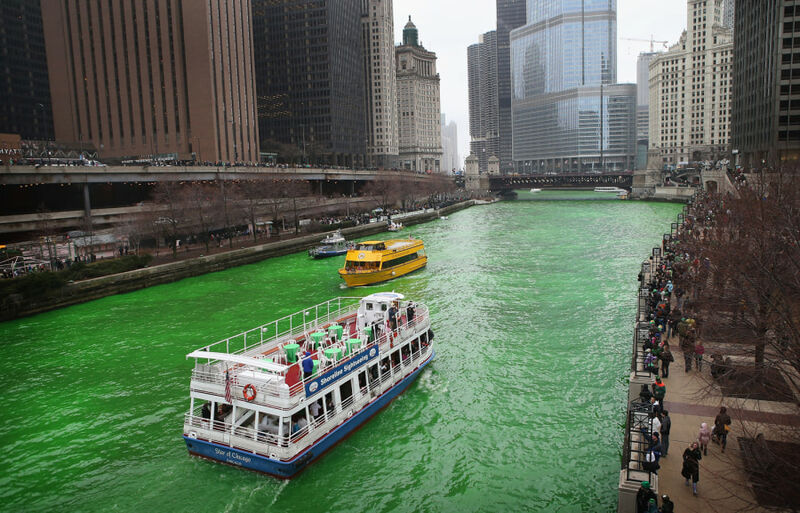 Tour boats travel the Chicago River after workers dyed it green to kick off the city's St. Patrick's Day celebration on Saturday in Chicago. The dying of the river has been a tradition in the city for 43 years.